Pyramyd Airsoft Blog: Airsoft Machine Gun Platforms - How Would You Like to Provide Support? Airsoft Machine Gun Platforms - How Would You Like to Provide Support? I thought for today's post on the Pyramyd Airsoft Blog, I would cover one of my favorite topics. Airsoft machine guns. For a long time, all I could think about was designated marksman rifle (DMR) platforms and was all about that role when playing games, but over the last year or two, I've really become attached to the support gunner role and all the fun & excitement it provides. So for those of you who have been considering the acquisition of an Airsoft machine gun to play a "supporting role" in your Airsoft squad or fire team but weren't sure on just exactly which platform suited you best, allow me to highlight some of the differences between some of the more well-known options out there. Perhaps the most common Airsoft machine gun you will encounter on the field in the M249 Squad Automatic Weapon, commonly referred to as the Airsoft SAW. These guys come in several different configurations, but the two primary base models are the M249 Para (top) and the M249 MkII (middle). There is also the M249 MkI (bottom), which I believe is, or was, commonly used by U.S. Army Rangers at one point in time. This one, for whatever reason, is much less common than the first two I mentioned. At least around the various parts of California that I've played. Most people that have them are true support weapon fanatics, like my brother, who loves them even more than I do, and I love them A LOT. Of course, then there's this guy. The M240 Bravo, which, in this case is made by Echo1 USA. In my opinion, the creme de la creme of Airsoft machine guns. Others may differ in opinion, but mine shall not waiver. This is, by far, the finest Airsoft gun I have ever had the privilege of pulling the trigger on. Seen here with a custom SR25 DMR and a WE Caspian Desert Warrior 4.3 single-stack 1911 GBB pistol. The weak need not apply when it comes to the M240 Bravo. 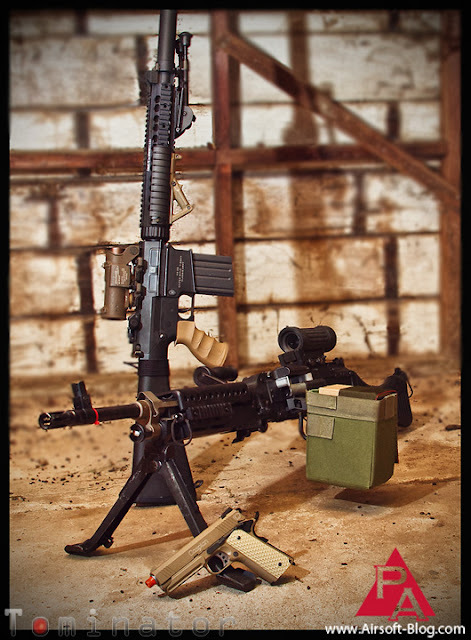 The real steel version is a 7.62mm NATO platform, so it fires "big boy rounds." The Airsoft Echo1 version remains consistent with the majority of the market by using 6mm BBs, but it boasts a full, precision CNC high-grade aluminum chassis and a 4,000 round box mag. When the mag is full, this gun easily clocks in at 19-20 lbs. It might not sound like much, but this thing's weight is no joke. You best make sure you ate your Wheaties before trying to field this thing with any level of effectiveness. Such a beast. Last, but certainly not least, of the support guns that I'll be covering today (NO, this isn't all of them!!!) is arguably my brother's favorite of the group, the M60VN. The VN, of course, stands for the Vietnam edition, because of the time period in which the real steel model was placed into service, or at least used prominently. My history is a little rough, but just go with me here, and if you really care, go read a gun history book or something. Anyway, this one is another full sized BB hose. 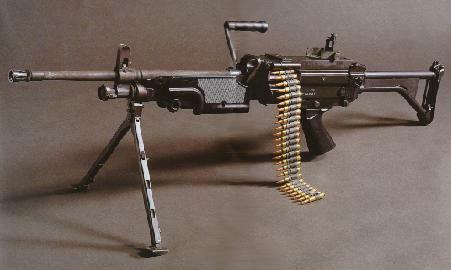 While lighter in over weight than the M240 Bravo, the M60VN, in this case made by A&K, also sports a giant, 4,000-5,000 round box magazine along with a primarily metal frame with a few sections of polymer in there. Now, I mean absolutely ZERO disrespect to the numerous support guns that I did not cover in today's post, but I figured the above items were plenty to chew on for the time being. 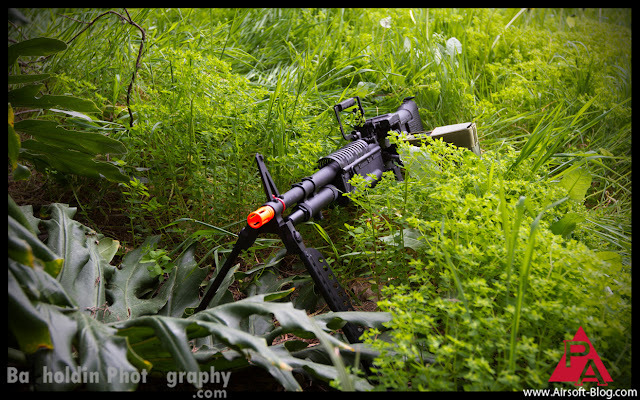 I will cover another batch of awesome Airsoft machine guns in a later post here on the Pyramyd Airsoft Blog. Thanks for checking us out.